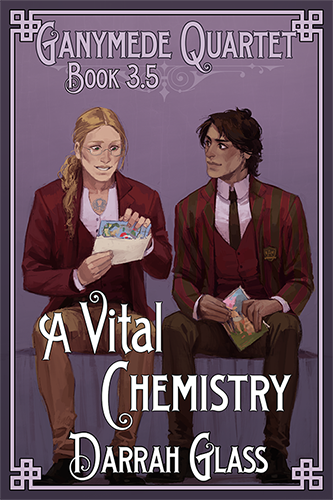 Always the last to go live…B&N links for A Willful Romantic (GQ Book 3) and A Vital Chemistry (GQ Book 3.5). 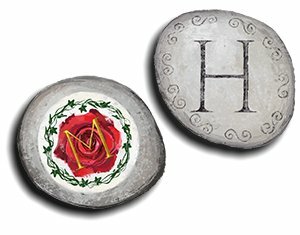 On Valentine’s Day, Martin prepares to tell Henry he loves him. It’s not appropriate for a slave to burden a master with his feelings, but Martin doesn’t think Henry will mind. He won’t let himself hope for Henry to return the sentiment, but the truth is that he feels loved. He knows how that feels because he was loved before—by his friend Richard at Ganymede. Martin treasures his memories of Richard, but he’s glad to be with Henry here and now. There’s a vital chemistry that draws Martin to Henry, and it’s unlike anything he’s experienced before. There’s more between them than Martin thought possible between master and slave, and he wants to believe it will endure, but he worries Henry will someday fall for a free man. Can Martin trust in Henry’s love? 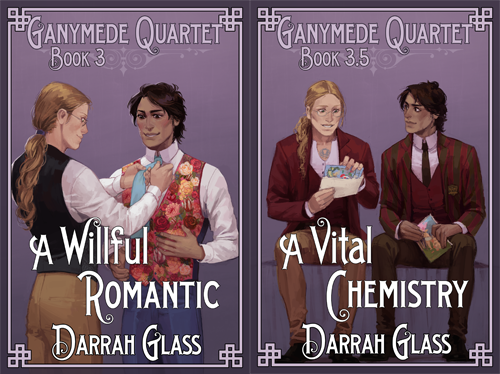 This story is told from Martin’s point of view and runs parallel to events that take place in Chapter 12 of A Willful Romantic (Ganymede Quartet Book 3).